Since then , there was no contact between officials of the two countries . Rouhani told reporters who interviewed him at Mehrabad airport , Iran , stating the phone between him and the President of the United States took place at the initiative of Obama . " We are on the way to the airport , when I was told that the White House phone contact our ambassador to the UN , " he said . "I was told that President Obama wants to talk to me for a few minutes . " 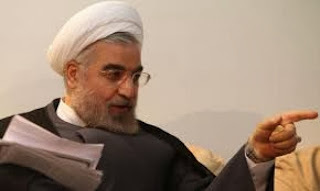 Iranian media later reported that Rouhani has brought home the 2,700 -year -old Persian artifacts in the form of a silver cup given to him as a " special gift " to the people of Iran . Artifacts depicting mythical lion -headed eagle was worth 1 million dollars has been seized by U.S. customs officials from smugglers in 2003.